As you know, we’re not only big supporters of local businesses in Eagle County, but also independent, Colorado businesses in general – especially ones we know will take care of and benefit our customers! So, today, we’re excited to share with you more about this great company. We see a lot of flooring in homes, but when we came across some work completed by Artistic Floors By Design, we were blown away! 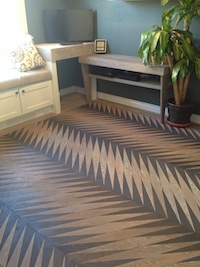 Joe and Joni – the owners of the company – started Artistic Floors By Design over 12-years ago. Joe had been in the business for nearly three decades. While he loved the work, he knew that something was missing. He wanted to have more say in the design and, more importantly, wanted to build a business around the community, giving back and providing the highest level of service to clients possible. The couple’s general skill sets and experience allowed them to do just that! Joni focuses on building and nurturing strong relationships with their industry partners and clients to a tee. Her thoughtful communication with everyone involved in a project and ability to ensure clients and industry partners are beyond thrilled with the project is evident each and every day. Joe truly is an artist at what he does. His ability to create a flooring masterpiece is not a skill that many have. 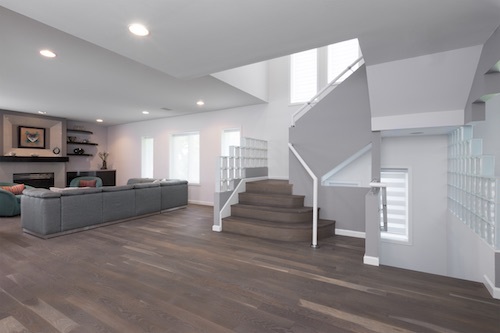 He is skilled and excellent in all aspects of flooring – standard installs, patterned floors, unique colors and finishes, handrails, stairs and more! He leads the team in creating beautiful work, backed by a pristine level of customer service. What really makes the company unique is that they truly care about their clients. “We walk our clients through the entire process. It’s a relationship to us, not just a job. We help educate them on taking care of their floors and always make ourselves available for any questions they may have,” said Joni. This explains why the company has built their business almost entirely on referral business. “People not only appreciate the level of service we provide, but also all of the certifications we hold. They seem to really appreciate the fact that we treat them like friends versus a dollar sign,” explained Joni. Joni and Joe are also HUGE supporters of their community and their trade. 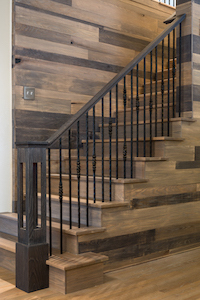 Joe is an active member of the National Wood Flooring Association and former member of their Board of Directors. He was also a Regional technical trainer who educated other wood floor contractors around the country, until Artistic Floors by Design started hiring and he needed to train their own employees. Joni just completed a long tenure as the Co-chair of the Parker Chamber of Commerce Business Education Committee. She volunteers and provides leadership for the Parker, Colorado Chamber of Commerce and helps develop and promote monthly workshops for small businesses. She also contributes to industry publications such as Hardwood Floors Magazine and is involved with local workforce development initiatives. 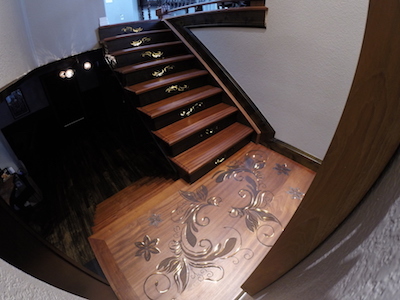 “The work that the team at Artistic Floors By Design does is really spectacular! Their attention to design and detail isn’t something you see every day in our industry. As big community supporters ourselves, we also really appreciate their dedication to their community. They are big supporters of educating people about ‘blue collar’ work and how this career path is not only personally rewarding, but also financially rewarding,” shared PCW owner Todd Morrison. If you’re interested in learning more about this excellent company or have a flooring project, take a look at their website and Facebook page. This is a company we know will surpass any flooring expectations you have. Keep up the awesome work, Joni and Joe!